When I saw the story a friend in Texas shared the morning of March 9, my heart broke for some of the Western states. It was the story of a young Texan couple and their friend who had each lost their lives trying to move their cattle to safety in a wildfire. As I read the story, so many thoughts raced through my mind, and I began researching what was actually going on as there was really no national media coverage on this event at the time. As I researched, my heart continued to break. This was not a small isolated event– over 1 million acres had burned, some were still burning, at least 3 more human lives were lost, and thousands of livestock were being lost- more each day. I sat there in shock, and then saw that another friend had close friends who were affected in Kansas. They had lost several homes and most of their ranch had burned. Again, more thoughts raced through my mind. I have less than 20 animals to care for, and I simply couldn’t imagine having to get that small amount of animals moved, while watching a fire come towards my small farm, let alone hundreds of thousands of head of cattle on thousands of acres. I couldn’t imagine watching my whole livelihood, the home I worked so hard to create, the animals that I raised and cared so deeply for be in such grave danger. I wanted to help, I wanted to go out there that very second and do something. I got up and headed to work continuing with my day. I felt a tinge of guilt. Here I was headed to work, on a normal day, while farmers and ranchers out west could not do the same as their whole lives had turned upside down. I then decided, I wanted to help Tennessee help the West in whatever way, big or small, we could. I sent a text to my good friend, Jennifer Burns, at Lonesome Cowboy in Lebanon. And that’s where the whole mission left my hands and control. I prayed to God, letting him know I was here to be his hand and feet, and asked for guidance through this effort. I knew I didn’t have the funds to deliver much out there, but I was ready and able to help in any way. Jennifer never hesitated, and said, “Yes, what can we do?” So, originally it was just going to be us two, driving one trailer load of supplies we could gather out there. 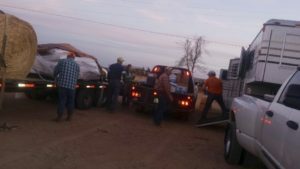 That changed quickly– we ended up rounding up a 5 horse trailer, a 24×8 flatbed, and a semi truck each loaded up with various items to deliver to the friends we didn’t know. Our community, who many hadn’t even heard of the devastation yet, did not hesitate to answer the call of help. Donations poured in, and the week flew by. Our small middle Tennessee Community never ceases to absolutely amaze me. We heard so many stories. 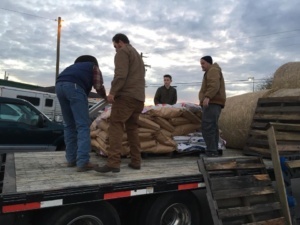 Stories of people had lost everything on their farm years ago in Tennessee tornadoes and remembered the outpouring of support they had received, and now they were more than happy to have an opportunity to pay it forward in the agriculture community. Stories of high school students selling ice cream sandwiches to gather money to purchase supplies to send. Stories from people in the communities out West reaching out to us with gratefulness that Tennessee cared about what was happening. Stories from people that weren’t even in the agricultural community, but had a great sense of respect for the farmers that commit their lives to working with their hands and raising animals and crops. The community rallied around this effort, and was just as proud as we were to be a part in aiding our neighbors who were and still are hurting so badly. In less than ONE week, thanks to our absolutely amazing community and a higher power helping things fall into place, no doubt, we received enough donations to begin filling every trailer we had lined up. Cash donations came in to help cover the $1500 of fuel costs to get there and back, and there was some left over to purchase more supplies, too! There was absolutely no way Jen, Jason, Bert, and I could’ve pulled this off alone. We were truly humbled and filled with pride to be able to deliver these trailers full of supplies and love. It was a long drive, but more than worth it. 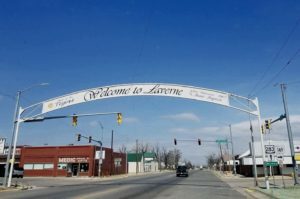 Our original destination of Pampa, TX was changed last minute and we were rerouted to the small town of Laverne, OK, as they needed the aid more at that time. Upon delivery, these people who were in the middle of the fires, and had seen so much pain, loss, and devastation all week, were grateful and hospitable. We were late on our arrival, so it was past dinner time, and we were obviously exhausted. But really, it did not compare to how tired these people were. Even so, they cooked a wonderful meal and asked us to stay a while as we were the last delivery for the night. Friendships that we will always cherish began that night. We heard stories and saw where the fire had literally came so close to engulfing their building, that the vinyl fence in the parking lot was melted to the ground. The fire had burned all around them. 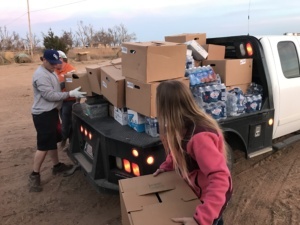 There were volunteers from Indiana, Southwest Kansas, and Oklahoma there helping unload supplies and deliver them to local farms and ranches. They told of the loss they had witnessed over the past week– delivering hay to farmers who were devastated because they lost almost all of their cattle– driving up on livestock that were almost 100 percent burned but still somehow alive and having to do the humane thing for them– seeing newborn calves searching for their missing mothers– we were brought to tears speaking with our new friends. But these people were in great spirits considering, and amidst the devastation around them, they said the outreach coming in to provide aid, was absolutely amazing. We got some much needed sleep and started our drive back the next morning feeling fulfilled and saddened that we couldn’t stay longer to help. It’s going to be a long process for these people to get their properties back in order. 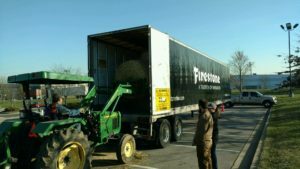 They will need hay supplies for a while and still need other supplies such as fencing, calf-milk replacer, mineral tubs, etc. If you are able, please don’t hesitate to donate to a reputable source out there. We’ve personally seen the devastation, and we’ve talked with affected people. They NEED any assistance that can be provided. We passed so many truck/trailer rigs headed out and returning to and from various parts of Texas, Kansas, Oklahoma, and Colorado while we were on the trip each time we passed one, they would honk, and our hearts and eyes would swell. We can honestly say the people on the receiving end of these donations were so appreciative and humble. A huge thank you goes out to all of those that helped us make this trip possible. Every donation, no matter how big or small, was sincerely appreciated by the people in Laverne, OK. Please know you were part of something great– Americans taking care of fellow Americans in a time of great need. Hickory Hill Farm is dedicated to healing the community – this was a mission for a larger community. We hope the supplies and support from TN helped heal the broken-hearted and provide a sense of hope.